SCOTLAND’s most senior police officer, Sir Stephen House, has brought forward his decision to step down amid mounting criticism of his force over a number of high-profile controversies. SCOTLAND’s top police ­officer is to step down amid mounting criticism of his force following a number of major controversies. Sir Stephen House, 57, who has led ­Police Scotland since it formed in 2013, said he had been “immensely proud” to be chief constable, but the time had come to take up new ­opportunities. He had been expected to stand down once his contract expired in September next year. But appearing before a meeting of the Scottish Police Authority (SPA) yesterday, Sir Stephen said he would now leave in December. First Minister Nicola Sturgeon was among those paying tribute to the Chief Constable, but political opponents welcomed his decision to resign. Police Scotland has been embroiled in controversies since the merger of the eight regional forces two years ago. Last month, the force issued an apology following the deaths of Lamara Bell and John Yuill in a crash on the M9. The couple spent three days in their car after police failed to properly log a call about the incident. Ms Bell’s brother Martin said Sir Stephen’s decision was something his family had been “looking for”. Addressing the SPA board in Stirling, Sir Stephen said: “As the leader of a national organisation that provides a vital public service 24 hours every day of the year, there can never be a convenient time to move on, but after nearly 35 years as a police officer and the last nine as a chief constable in Scotland, I believe the time is right for me to take up a new challenge and thereby allow the process to recruit my successor to begin. Sir Stephen’s announcement surprised many, coming only a week after he issued a statement defending his force in the face of growing criticism. He had also resisted calls for his resignation in the days following the M9 incident. Ms Sturgeon said Sir Stephen’s focus on tackling violent crime had played a part in recorded crime falling to a 40-year low. She said: “I also recognise his powerful and long-standing focus on tackling domestic violence and sexual crime. At a time when we are celebrating a century of women in policing, his track record in encouraging and supporting women in the service should also be recognised. Sir Stephen has faced criticism over his handling of a range of issues, from stop and search to armed policing. As well as the M9 crash controversy, there is also an investigation by the Police Investigations and Review Commissioner (Pirc) into the death in custody of Kirkcaldy man Sheku Bayoh earlier this year. Recently it has also been alleged Police Scotland is one of two UK forces to breach guidelines on intercepting the communications of journalists. Scottish Lib Dem leader Willie Rennie said: “A new chief carrying on as if nothing is wrong will cement the problems rather than solve them. “Ultimately, the SNP government must accept responsibility for this chaos. They rammed through the centralisation of our police service despite warnings. They set up the toothless Scottish Police Authority. They appointed the Chief Constable. Labour’s justice spokesman Graeme Pearson, a former deputy chief constable of Strathclyde Police, added: “This is the right thing to do, and on behalf of Scottish Labour I would like to extend thanks to Sir Stephen House for his years of service. “However, we know the problems in Police Scotland extend far beyond the Chief Constable. It was only a few weeks ago that the First Minister gave her full backing to Sir Stephen, and now the SNP government can no longer hide behind him. Sir Stephen’s announcement comes ahead of the publication of a Police Scotland staff survey, which is expected to be made public next month. Senior officers have already warned that the survey is likely to bring “bad news” for the single service. Unison branch secretary George McIrvine, who represents civilian police staff, said: “Sir Stephen was given the impossible task of merging Scottish policing into one police force. FATHER-OF-TWO Sheku Bayoh died in police custody following an incident in Kirkcaldy on 3 May. His family have been extremely critical of police, alleging they were told five different versions of what happened. 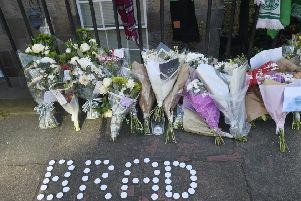 Police Scotland has been unable to comment on the incident while an investigation is carried out by the Police Investigations and Review Commissioner (Pirc). However, the Scottish Police Federation, a staff association, has said a female officer was left badly injured and “fearing for her life” during the incident. Earlier this month, the Pirc submitted an interim report to the Crown Office, which is considering if a criminal prosecution will take place. THE longest-running controversy faced by Police Scotland surrounds its use of stop and search. A well-used tactic under some of the previous regional forces, the number of stop-searches across Scotland actually fell following the set up of the single force. However, it grew exponentially in areas of the country that had not previously used the tactic. The force was caught out after figures obtained by the BBC appeared to show young children were continuing to be searched, despite assurances from senior officers to the Scottish Parliament that the practice had been stopped. Stop and search is currently being reviewed by an independent advisory group set up by the Scottish Government. It is expected so-called consensual stop and search will be abandoned altogether. EARLIER this month, a Sunday newspaper claimed Police Scotland was one of two UK forces that had broken the rules about spying on journalists and their sources. The Interception of Communications Commissioner’s Office (IOCCO) is investigating possible breaches of its code of practice but will not name the forces involved while its inquiry is ongoing. Asked about the allegations during yesterday’s Scottish Police Authority meeting, Sir Stephen said he had “nothing to add” while the IOCCO probe was ongoing. Investigative journalist Eamon O Connor claimed in an interview with the BBC earlier this month that police had monitored his communications while he investigated the 2005 unsolved murder of Emma Caldwell. POTENTIALLY the most serious controversy facing Police Scotland is the fall-out from its handling of the M9 crash, which claimed the lives of Lamara Bell and John Yuill, pictured. The couple’s crashed car was not discovered for three days after a call from a member of the public was not properly logged. According to Ms Bell’s brother, his sister was still conscious and trying to escape when her rescuers arrived. She later died in hospital. The Police Investigations and Review Commissioner (Pirc) has launched an inquiry, while HM Inspectorate of Constabulary in Scotland is reviewing call handling at Police Scotland’s control centres. WHILE armed officers had operated under three of the legacy forces, the decision to extend a standing authority across the whole of the country caused controversy when gun-carrying police were seen on the streets of Inverness. Sir Stephen initially defended the decision in the face of widespread criticism before announcing armed officers would attend only armed incidents and those where there was a “threat to life”. A poll for the Scottish Police Authority found a “narrow majority” of the public backed allowing armed officers to attend routine incidents with visible firearms.